Cross-species social groups shows that tolerance is present in the animal world. If you’re one of those that follows my writing here at Klat (there’s got to be one of you out there, right? ), then you know I like to write about dolphins and whales. So when I get to write about both, especially when the news is uplifting, I’m pretty pleased. 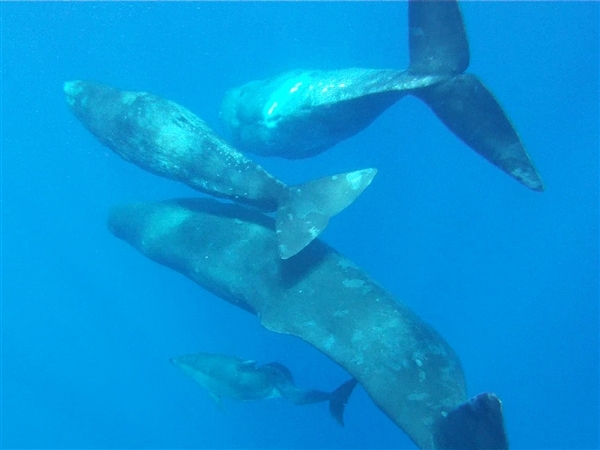 The latest interesting case involves a group of sperm whales that seem to have adopted, at least temporarily, a dolphin with a spinal deformity. The sperm whale pod was spotted with the dolphin in the North Atlantic. The dolphin was a grown adult and it was witnessed both hanging out with the whales as well as rubbing up against them. The whales appeared to be perfectly okay with the affection, even in the presence of their calves. There are other cases similar to this in the wild, where one species makes friends with another. Some do it for mutual protection from predators, some to maximize the chances of finding food, while others do it for little more than to have a friend around. The dolphin may have ended up with the whales due to his not being able to keep up with his own group, but the whales really have no reason to keep him around. Usually the two species have a rivalry and the whales are, in the long run, getting very little advantage from having a dolphin straggler. So it would seem they like his company. Or, as some suggest, they may just think he’s a strange whale calf. Researchers are unsure of how long the relationship will go on and whether the whales will be permanently adopting or not. Chances are more likely that they just want someone to hang out with for a while. Still, it’s a pretty remarkable pairing and a lesson to humans about how even these supposedly “lesser” species are better than us in some ways. Whale protection in Australia being ignored?